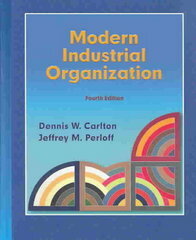 Modern Industrial Organization 4 Edition I. INTRODUCTION AND THEORY. 1. Overview. 2. The Firm and Costs. II. MARKET STRUCTURES. 3. Competition. 4. Monopolies, Monopsonies, and Dominant Firms. 5. Cartels. 6. Oligopoly. 7. Product Differentiation and Monopolistic Competition. 8. Industry Structure and Performance. III. BUSINESS PRACTICES: STRATEGIES AND CONDUCT. 9. Price Discrimination. 10. Advanced Topics in Pricing. 11. Strategic Behavior. 12. Vertical Integration and Vertical Restrictions. IV. INFORMATION, ADVERTISING, AND DISCLOSURE. 13. Information. 14. Advertising and Disclosure. V. DYNAMIC MODELS AND MARKET CLEARING. 15. Decision Making Over Time: Durability. 16. Patents and Technological Change. 17. How Markets Clear: Theory and Facts. VI. GOVERNMENT POLICIES AND THEIR EFFECTS. 18. International Trade. 19. Antitrust Laws and Policy. 20. Regulation and Deregulation.